Your email address is the one that you used to register for lessons. Use the reset password function if needed. Up to three (3) make-up credits can be generated per semester. Plus students can attend the bonus group class as an additional make-up. Credits must be used during the semester. After cancelling a lesson though the calendar, the student’s account will be issued a make-up credit. Check the calendar frequently for available lesson times. Use the make-up credit issued to reschedule a lesson at least24-hours in advance of that lesson time. Parents must utilize the My Music Staff Calendar at the link provided above. Samara Rice Music is unable to accommodate reschedule request via email, phone, or text. Select the “Home” page from the LEFT menu. Scroll to the bottom of the page to see available make-up credits and available lesson times. Click on the GREEN CHECK to register for that lesson time. Please note that make-up credits are based on the student’s default lesson length. A student that typically has a 60-minute lesson can book a 30-minute lesson-slot and it will only use 0.5 make-up credits. However, a student that typically takes a 30-minute lesson will only be able to book a 30-minunte lesson-slot. Please email SamaraMusicLessons@gmail.com if your family has two (2) 30-minute students that would like to book a 60-minute make-up slot. Priority for longer make-up lesson-slots will be given to students with a matching longer lesson length. All reschedules must be handled through the My Music Staff online calendar. Reschedules/Make-up lessons are based on availability and NOT guaranteed. Lesson tuition amount remains the same regardless of cancellations or make-ups. Please check NOW that you have access to the My Music Staff Calendar. Your login email address is the one that you registered with (it is also the one that the reminder emails go to each week). All available times will be posted on the My Music Staff Calendar. Parents must utilize the My Music Staff Calendar at the link provided at the top of this document. 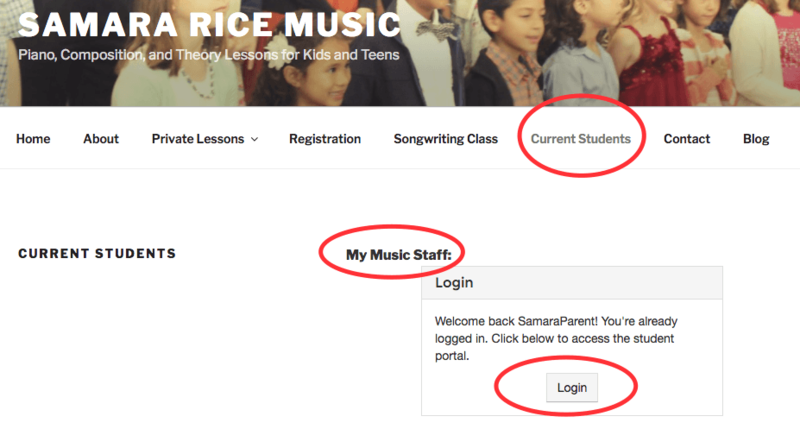 Samara Rice Music is unable to accommodate reschedule requests via email, phone, or text. The calendar is updated frequently. If you don’t see a time you want one day, keep checking the calendar periodically for the times you would like. If the student cannot do the make-up on the week that the lesson was missed, the student could double up on a future week. It is fine for the student to have lessons scheduled back-to-back, or on consecutive days. In order for the makeup calendar to work effectively, notice of student absence must be given 48-hours in advance. If late notice is given, or in the case of a no-show, the lesson cannot be credited or made-up. Please note that last minute technical issues could cause a student to miss out on rescheduling or receiving a make-up credit. Please plan in advance, as after hours assistance cannot be provided. Make-up lessons must be booked online at least 24-hours in advance. Each semester a free bonus group class will still be offered for last minute cancellations, illness, or as a free bonus for those with perfect attendance. Tuition remains the same each month regardless of reschedules or make-ups. Make-up credits can only be used on months that tuition is paid and may be used in addition to regular lessons, not as a substitute. All make-up credits are void as soon as a student discontinues lessons. Makeup credits can be used throughout the entire semester. Credits reset to zero at the end of the semester. 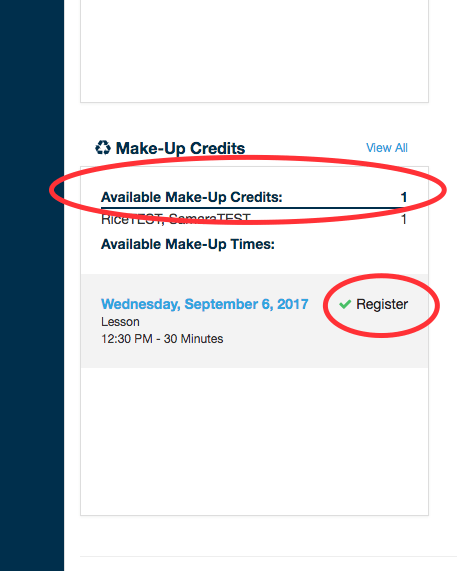 For example the fall semester make-up credits automatically reset to zero on December 23rd, 2017. Samara Rice Music provides professional piano lessons and is conveniently located in Huntington Beach, California, with easy access for students from Seal Beach, Sunset Beach, Newport Beach, Fountain Valley, Long Beach, Westminster, Garden Grove, Cypress, Midway City, Lakewood, and Costa Mesa, and more.